Standard: 5/10 on the mobility scale (10 being the most demanding). General fitness required. There are stairs to the churches. We will have some walks, but nothing strenuous. Walks are on uneven rocky terrain, sturdy footwear required. If walks are too demanding there is always an option to skip the walk. We will expect late spring weather in the mountains, which means it could be anything. Prepare for temperatures between 40-75F, likely that we will have at least one rainy day. This will be flower season! Join the Cathedrals of Tao cultural tour (Georgia & Turkey), starting on May 3rd. Very complimentary to this itinerary! 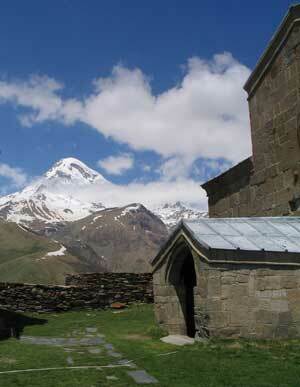 Add a 3-day extension trip up the Russian Military Highway to the highland region of Kazbegi (May 29th-31st). This newly developed tour program focuses on the most important Christian sites in Armenia and East Georgia. Our tour begins and ends in Tbilisi, the thriving cultural and business capital city of Georgia. 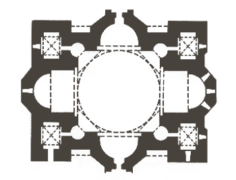 Our accommodation in the heart of the rejuvenated Old City places us within easy walking distance of the many wonders of this ancient city including churches, mosques, synagogues, carpet shops, and boutique cafes. We will visit several newly reopened museums featuring high quality exhibits on pre-Christian gold jewelry, medieval Christian embroidery, and the Soviet occupation. On day 3, we travel south to Yerevan, the bustling capital city of Armenia, where we plan to visit a variety of sites including the house museum of the avant garde film-maker Sergei Parazhanov, the Matenadaran manuscript museum, and the outdoor carpet market. The focus of our travels outside of these capital cities will be the UNESCO-recognized world heritage sites. 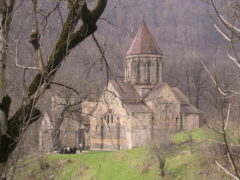 Many of these are medieval Christian churches that are testament to the architectural creativity and spiritual dedication of Georgians and Armenians. 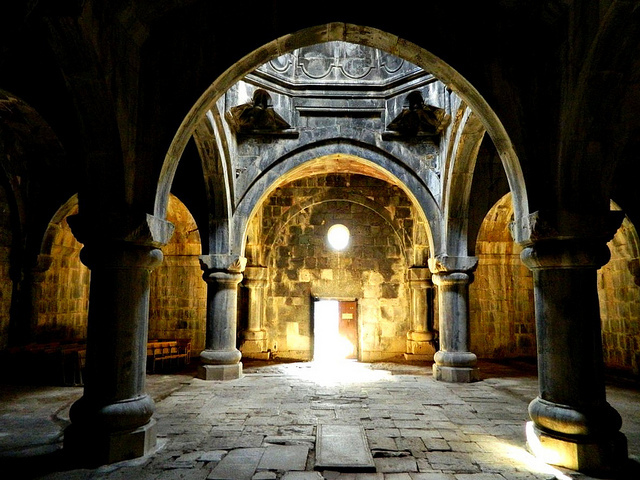 Two of the most important include the Echmiadzin cathedral and seminary, the spiritual center of Armenian Christianity, and its Georgian counterpart, the cathedral of the Life-Giving Pillar in Mtskheta. Meanwhile, both Armenians and Georgians reserved some of their finest architectural masterpieces for the most inaccessible and hidden places. 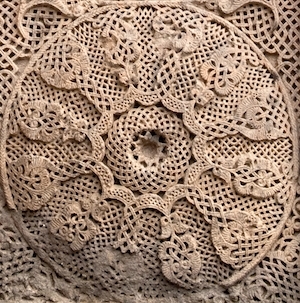 Some exquisite examples are the rock-hewn churches of Geghard and monastery of Goshavank in Armenia, and the frescoed caves of Davit Gareji in Georgia. No trip to the Caucasus is complete without indulging in some of the delicious homegrown wine, as this region boasts the first evidence of cultivated grape pips (dating to 6000BC). In the Alazani Valley, where we will stay for two nights at the end of the trip, viticulture is still visibly the culture of the land as almost every local villager produces their own wine from their own grape varietals (more than 430 varietals exist in Georgia alone). 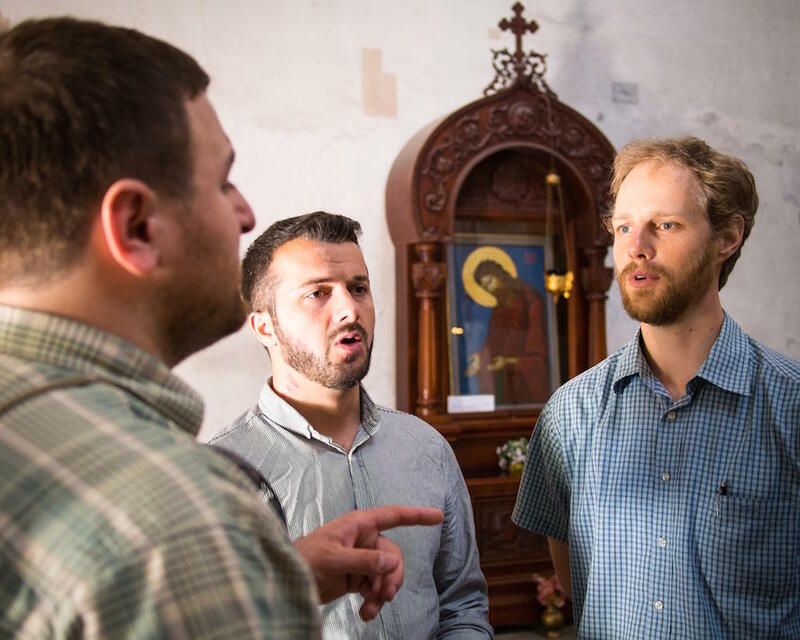 As on all of our tours, the leadership team includes singer-instrumentalists who will enliven our culture with music from each of the regions we visit. Our tour pays very close attention to providing unique dishes at every meal, while being conscious of individual dietary restrictions. This tour will be a feast in all ways: intellect, spirit, and body! 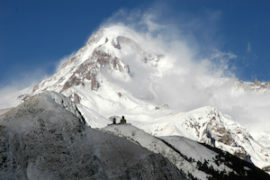 The southern slopes of the Great Caucasus range, stretching south to the headlands of the Tigris and Euphrates in the Eastern Anatolian Plateau, are the lands historically inhabited by Georgian and Armenian tribes. Herodotus and Xenophon described their cultures, and many great civilizations have coveted their mountain rivers and lush valleys. The list of conquerors includes the Hittites, Greeks under Alexander, Romans under Pompeus, Parthians, Sassanid Persians, Arabs, Mongols, Tamerlane, Saffavid and Qajar Persians, Seljuk and Ottoman Turks. Even the mythological hero Jason and the Argonauts traveled here in search of the fabled Golden Fleece. The history of the ancient city of Samshvilde [Place of the Bow] located in the marchlands between Georgia and Armenia (a featured site on this tour), serves as a microcosm of these vast military movements as its temporary Georgian or Armenian occupants were besieged by Alexander the Great, the Mongols, the Safavid Persians, and the Seljuk Turks, among others. 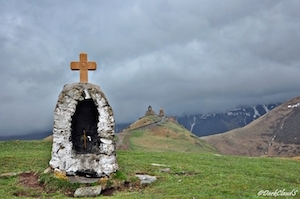 Christianity played a decisive role in the parallel histories of Armenia and Georgia. Both were among the first states to convert to Christianity (309 and 337 respectively). In the fifth and sixth centuries, their religious paths would split along theological differences, the Armenians choosing the non-Chalcedonian monophysite doctrine, while Georgians chose to remain allied with Byzantine Orthodox doctrine. Christianity became an extremely important factor in the identities of both nations as they struggled to unite quarreling tribes against the superior forces of invading armies. Indeed, a third Christian nation in the Caucasus (the Albanians) completely disappeared from world history during the Middle Ages, presumably due to slaughter and forced conversion. 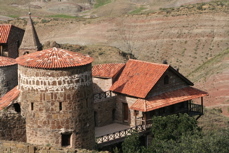 Both Georgian and Armenians maintained active monasteries beyond their territories, such as in Greece, Antioch, Jerusalem, and elsewhere. These monasteries served an important educational function as scribes translated and inscribed Christian texts into illuminated manuscripts. Within their home territories, Christianity became an important symbol of state identity and power, with the monarchy and local aristocracy sponsoring the construction of grand cathedrals in the city centers and ornately carved monastery churches in the remotest mountain valleys. Today, Christianity is in strong revival in Georgia, while in Armenia, religiousity has been slower to rebound after the Soviet period. + Tbilisi, capital city of Georgia, founded in the 5th century by King Vakhtang Gorgasali. A center of trade and conflict for centuries, Tbilisi has been sacked forty times by various invaders but survives today as the modern hub of the South Caucasus. Nevertheless, the downtown area is full of winding cobblestone streets, small shops and restaurants, as well as the churches, synagogues, and mosques that celebrate the diversity and history of this unique capital city. Mtskheta, the ancient capital of Iberia (East Georgia), lies at the confluence of two rivers just 20 miles upstream from Tbilisi. 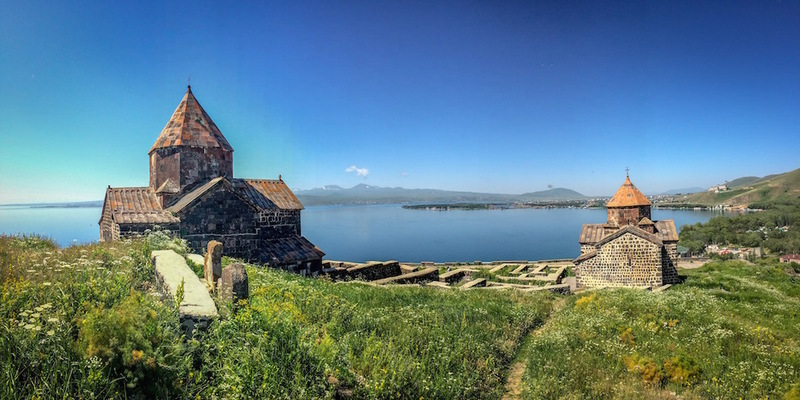 Dominated by the 11th c. Cathedral of the "Living Cross," Mtskheta was once the thriving trade capital of East Georgia. The Romans reached Mtskheta in 65 AD, as evidenced by the remains of a bridge left behind, and in the early Christian era, St. Nino the Enlightener worked miracles that converted King Mirian and Queen Nana to Christianity in 337 AD. 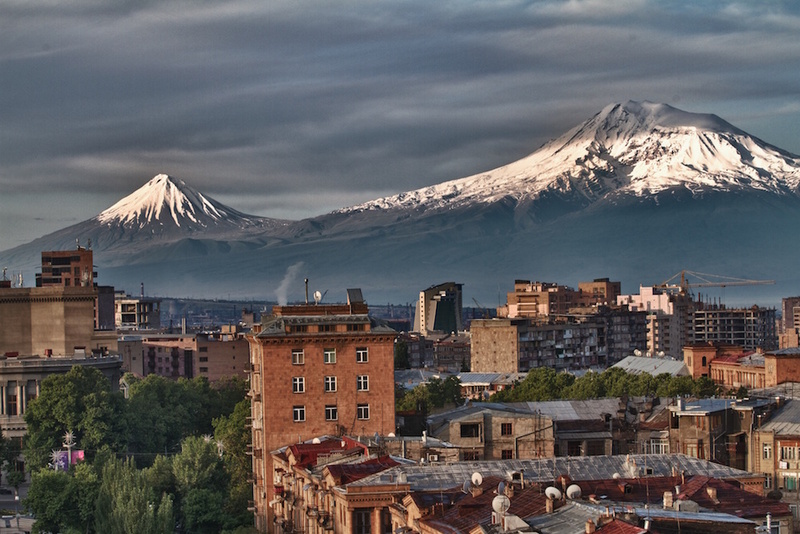 + The tour begins in Yerevan, the capital city of Armenia. Once a village hamlet, Yerevan was completely redesigned on a radial plan in the early twentieth century, focused around the Opera house and several prominent museums and monuments. 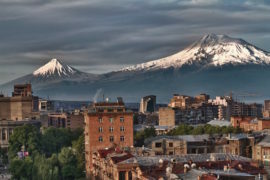 With boulevards oriented towards the imposing extinct volcano of Mount Ararat, pedestrians wandering between artisan shops and open air cafes might be startled by impressive views of the Ararat valley. The Matenadaran Institute of Manuscripts contains a world-class exhibit of medieval illuminated manuscripts from around the world, augmented by a map-room of ancient maps of the Caucasus region, and beautifully calligraphic Persian and Arabic official documents. Another museum of exceptional quality is the house museum of the avant-garde film-maker Sergei Parazhanov, which contains much of his little-known production in ceramics, collage, and costume. + The lake is one of the largest high-altitude fresh water lakes in the world at over 6000 feet above sea level. Interestingly, while the lake is fed by as many as 28 different rivers and streams, evaporation accounts for over 90% of its outflow. 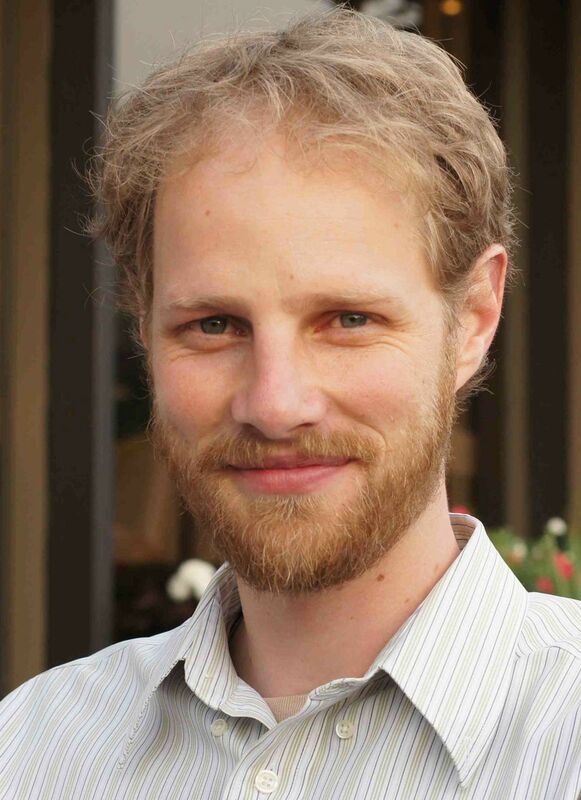 Human intervention in the ecosystem of the lake has taken its toll. In 1933, Stalin approved a plan to lower the level of the lake by 55 meters to increase arable land, produce hydro-electricity, and create fisheries. After just seven years in operation, nearly half the volume of the lake had been drained. Ever since, the Lake Sevan Commission has been attempting to stabilize the lake level by diverting other rivers through tunnels and other schemes. Historically, the lake has been highly significant, attested to in Persian, Greek, Georgian, and Armenian sources. Several medieval monuments surround the lake including the Noraduz khatchkar (cross-stones) field and the ninth century Hayravank and Sevanavank monasteries. 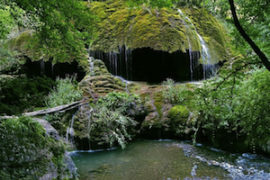 + The Lori region, in the border marchlands between Armenia and Georgia, is dominated by a high-walled basalt canyon that follows the snaking contours of the Debed River. One of the primary trade routes between lowland Georgia and upland Armenia, the canyon served as an important gateway for travelers along the northern Silk Road. The scriptoria of its famous monasteries at Haghpat, Sanahin, and Akhtala grew in prominence especially in the 12th-13th centuries, when King David the Restorer of Georgia liberated the area from Arab and Seljuk control. 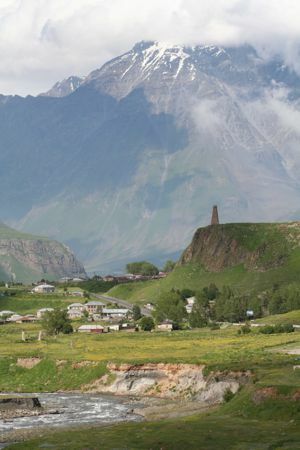 In modern times, the region is known for industrial cities such as Vanadzor, Spitak, and Alaverdi, and was the epicenter of an earthquake in 1988 that unfortunately coincided with the economic collapse of the Soviet economy. Tourism has brought some life to Lori, as visitors flock to see the majestic grandeur of medieval monasteries perched on canyon plateaus far above the river below. 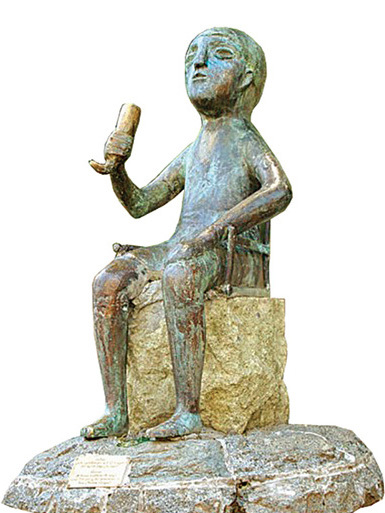 + Telavi, the regional capital of the Kakheti region in East Georgia, was the historical seat of the lowland Georgian kings allied with the highland tribes in Tusheti, Khevsureti, and Pshavi. 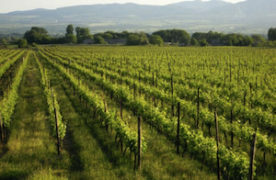 In the Telavi region, at the head of the rich Alazani valley, there are many famous monasteries and castles set amidst long rows of cultivated vineyards. 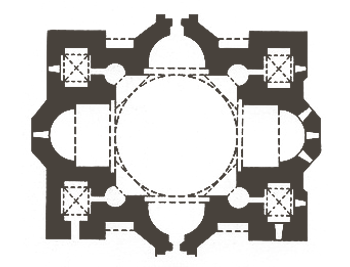 These include the 8th c. double-domed Kvelatsminda church, the 11th-12th monumental Alaverdi Cathedral and secluded Iqalto Academy, as well as the 16th c. Gremi fortress and Shuamta Convent. Our visits to the region always include local wine-tastings, song, and feasting!